There may be items in your trash that could help you with your gardening. Check out this list and see if any of these great ideas resonate with you, helping you pull a couple things out of your trash and, well, into your garden to green up your world. If you don’t have these items in your trash, ask for them on your local Buy Nothing group. I’ve categorized the ideas by item, and each one links to a unique reuse. Enjoy! 1) Plastic Bottle Mosquito Trap: This one is a trick using yeast and a cut bottle glued together. Read on and try it. 2) Plastic Bottle Cloche: It’s as easy as cutting a plastic bottle in half and sticking it upside down over your seedling or plant. 3) Plastic Bottle Self-Watering Seed Starters: These plastic bottles, cut in half and one inverted inside the other have a wicking system worth checking out. 4) Plastic Bottle Drip Irrigation System: 4 small holes in your 2-liter bottle that’s buried in the ground provide excellent watering for your plants. 5) Plastic Bottle Greenhouse: A greenhouse like this is a true inspiration. 6) Milk Jug Scoop: Milk or OJ jugs make easy scoops. 7) Milk Jug Cloches: Use Milk Jugs to protect your larger plants. Just cut the bottom out of the milk jug, turn it upside down and it’ll protect your plants. 8) Milk Jug Mini Greenhouses: These mini greenhouses in gallon jugs can prove useful. 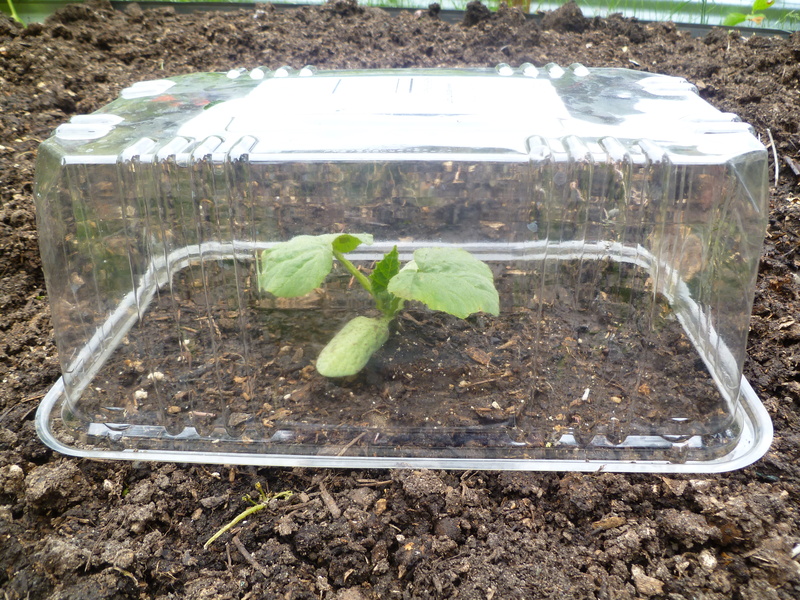 9) Plastic Container Mini Greenhouse: Just turn it upside down and you have a mini cloche/greenhouse. 10) Cardboard Weed Block: Take your cereal boxes and cracker boxes to the garden and use them as weed blocking. 11) Bike Wheel Trellis: Bike wheel trellises are beautiful. 12) DVD/CD Bird Scaring Trick: Birds don’t like reflective stuff. It scares them off. Put a few around your berries and you’ll keep those peckers away. 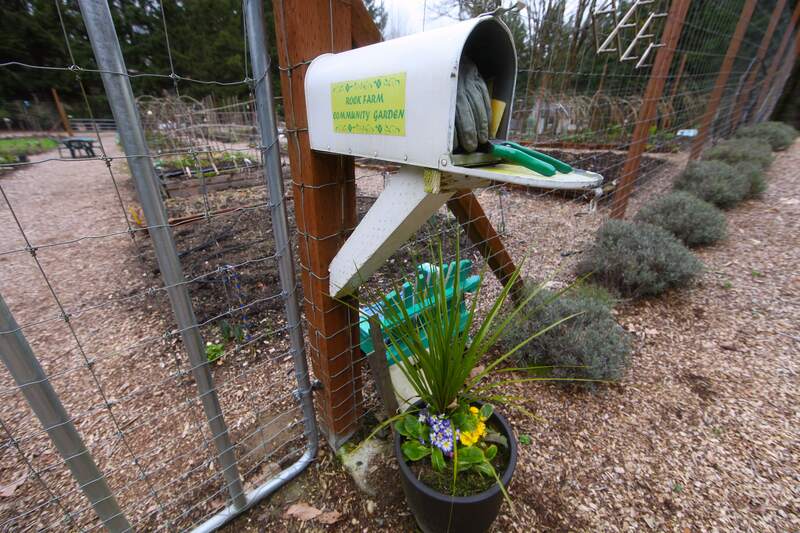 13) Mailbox Garden Tool Cache: Post an old mailbox up in your garden, and you have a water-proof place to store hand tools, planter markers, and your notes. 14) Drawer Seedling Starter: This one’s easy. Just use an old drawer as a seedling planter box. 15) OJ Can Plant Labels: The can tops make pretty labels for marking your rows. 16) Rain Boot Planters: Save a few pairs of the kids cute rain boots for whimsical planters. 17) Plastic Plant Pot Flowers: Add a little flair to your outdoor space with these plant pot flowers. 18) Trash Can Root Cellar: I’m interested in trying this for storing our potatoes, carrots, daikon radish, turnips and cabbages next year. It simply requires digging a deep hole. 19) Tupperware Worm Farm: Make a few holes in your old Tupperware bins, order a few hundred red worms, follow the instructions here and you’ll have a worm farm. 20) Plastic Bottle Cap Lawn Flowers: Michele Stitzlein creates beautiful blooms from plastic caps. She’s published a couple of books on plastic cap art, too. 21) Glassware Flowers: These bowls and dishes are all the rage. 22) Garden Hose Flowers: If you have space on a wall, you could create flowery art from your old hoses. 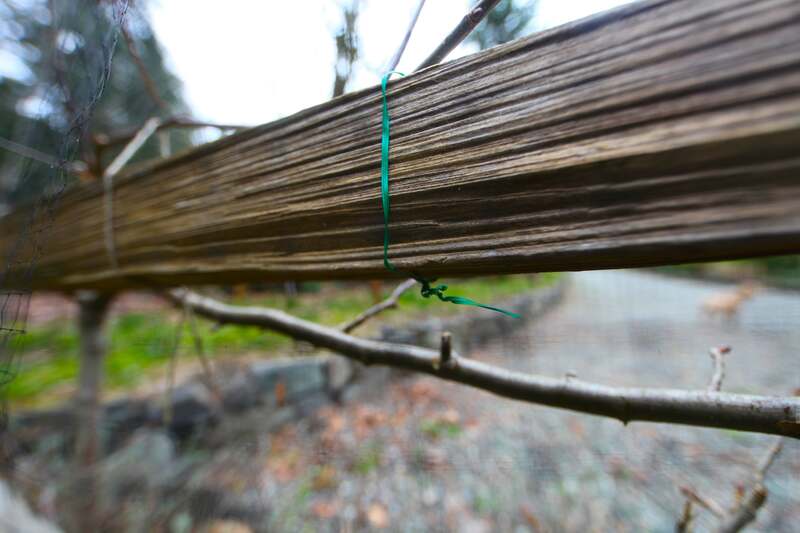 23) Twist Tie Plant Trainers: Save your twist ties to use for training plants to fences and stakes. 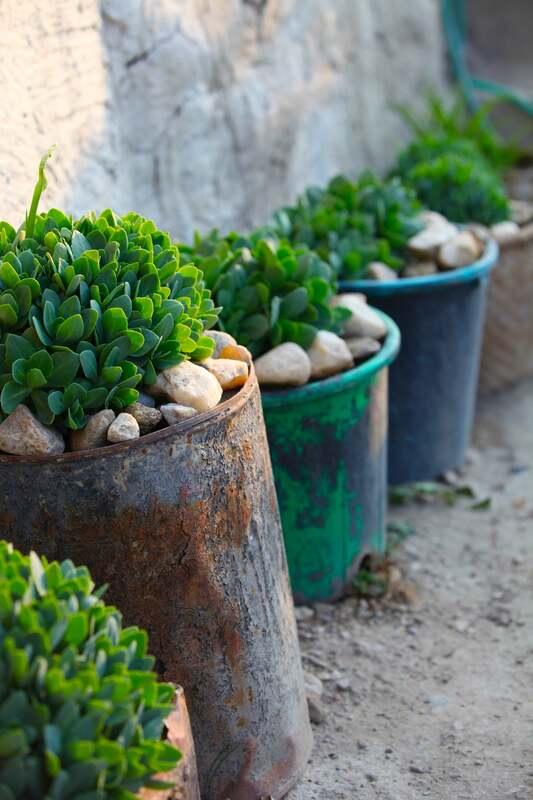 24) Soda Can Planters: In a pinch, soda cans can be used as planters and seed starters. 25) Pop Can Plant Markers: With a little effort, you can make some pretty markers for your garden. 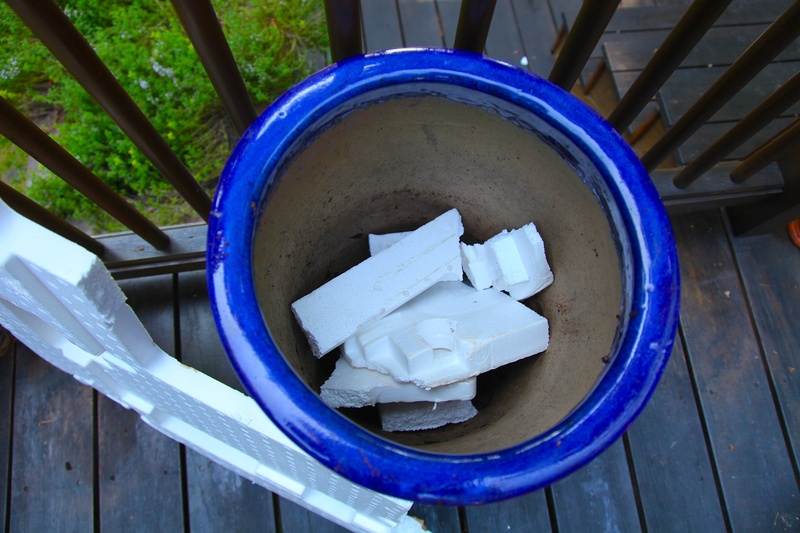 26) Styrofoam Planter Filler: Fill the bottom of your large plant pots with styrofoam so they don’t get too heavy. 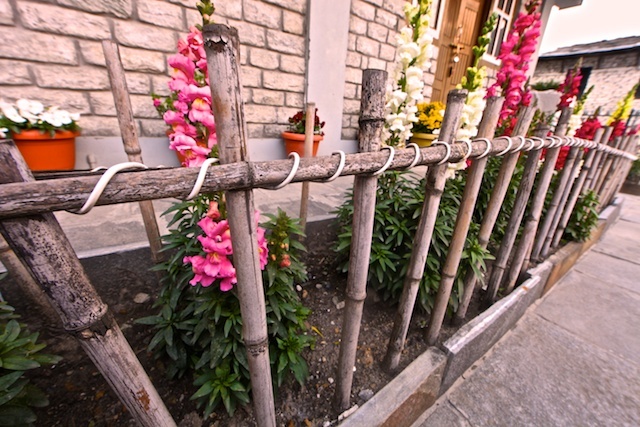 28) Coaxial Cable Fence: Who knew that a coaxial cable could look so pretty with bamboo? 29) Wine Bottle Waterer: Turn your empties upside down (with H2O in them) in your plant pots and go on vacation! 30) Wine Bottle Garden Edging: Wine bottles can make colorful garden edging. 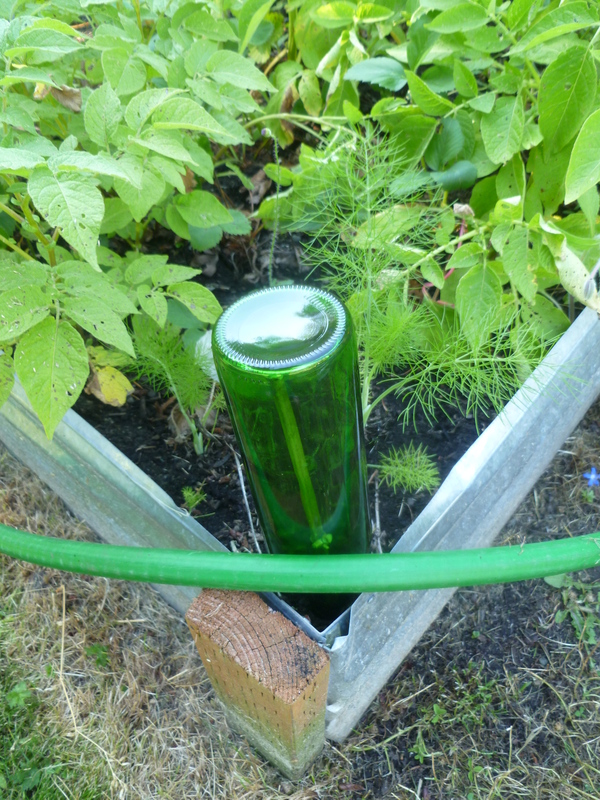 31) Wine Bottle Hose Guard: A wine bottle and a stick are all that’s needed to keep your hose out of your garden beds. 32) Clementine Box Planters: Clementine boxes make excellent seedling starter boxes or planters for forced bulbs. 33) Blue Jeans Garden Apron: Sew yourself a simple garden apron from an old pair of jeans that can hold your garden tools. 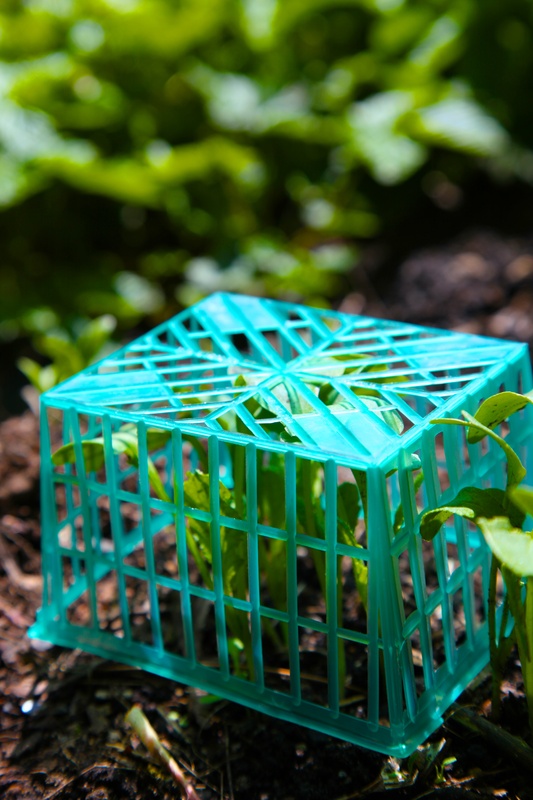 34) Plastic Mesh Seedling Saver: We use these baskets to prevent slugs and birds from destroying our seedlings. 35) Windows Greenhouse: This is a simple design for a small greenhouse made from windows. 36) Window Frame Trellis: An old window frame with mullions makes a pretty trellis. 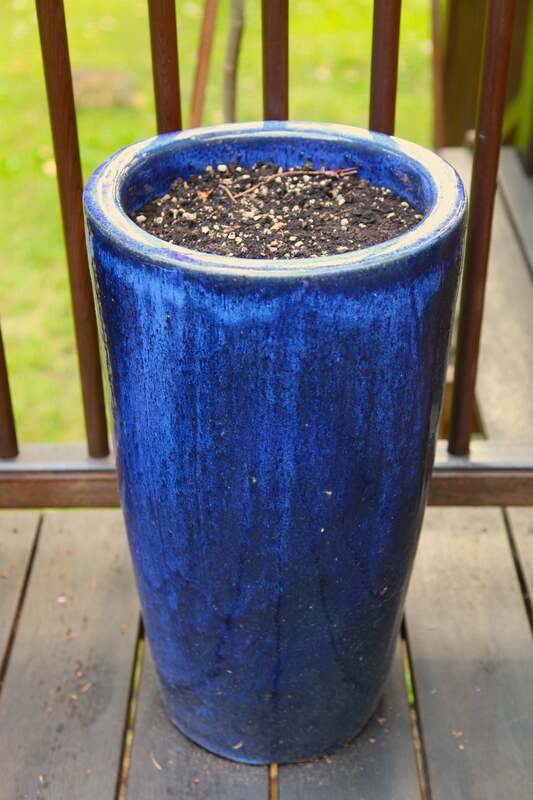 37) Broken Ceramics Pot Drainage: Put your broken ceramic pieces in the bottom of plant pots for added drainage. 38) Plant Your Broken Dishes: Plant your favorite broken dishes in the garden and enjoy them throughout the growing season. 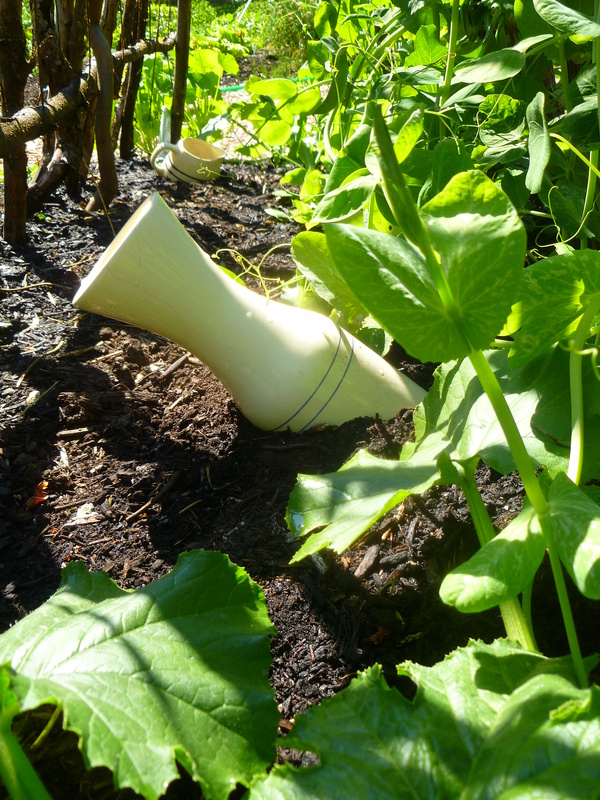 Broken Pot Planter: When our ceramic pots break, I plant them in our garden along with something planted to look as if it’s spilling out of the pot, having grown there over time. 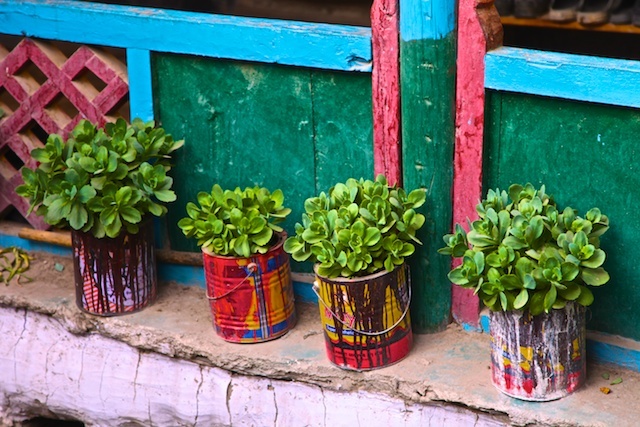 39) Paint Can Planters: I love these paint cans turned planters at my friend Maya’s house in Tsarang, Upper Mustang, Nepal. 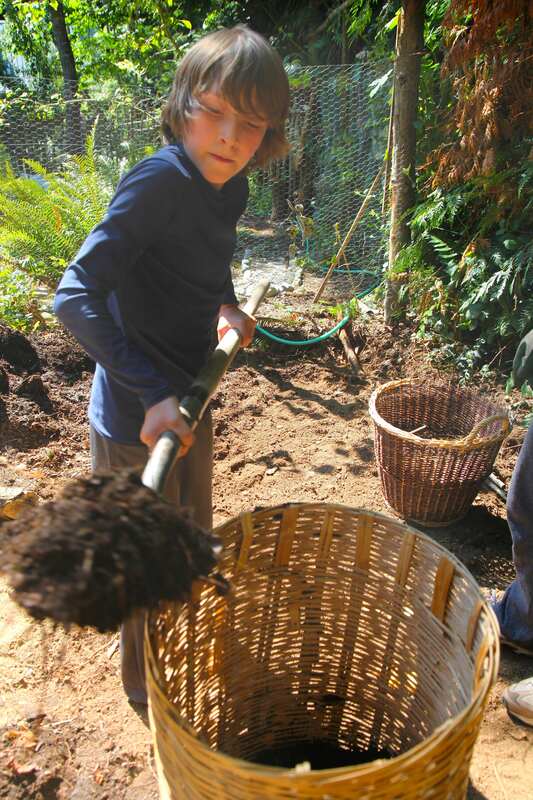 40) Laundry Hamper Potato Planter: I planted potatoes inside an old laundry hamper and the harvest was easy. 41) Ski Fence: If anyone lives in the Seattle area and wants to make one of these, please contact us as we have several hundred skis at the end of our Rotary Auction. 42) Mini Blind Plant Markers: These look really easy to make. 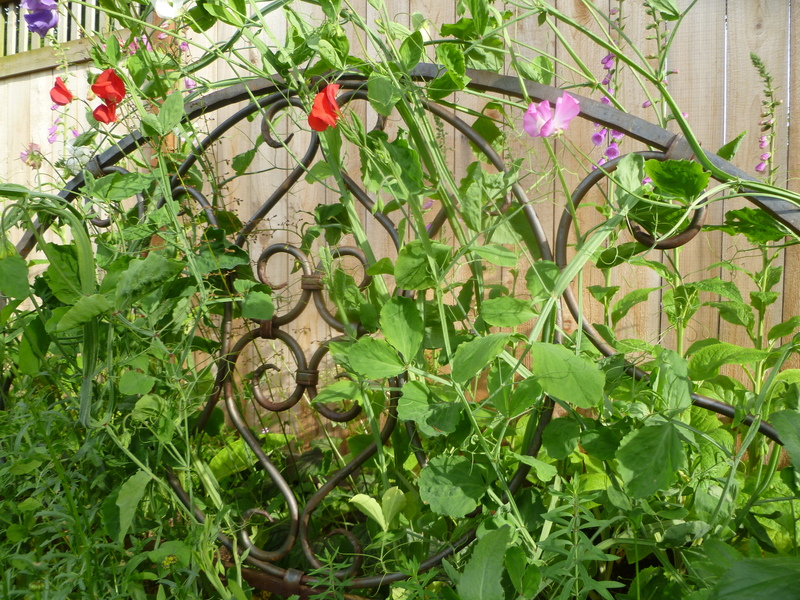 44) Headboard Trellis: A headboard makes a beautiful pea trellis. 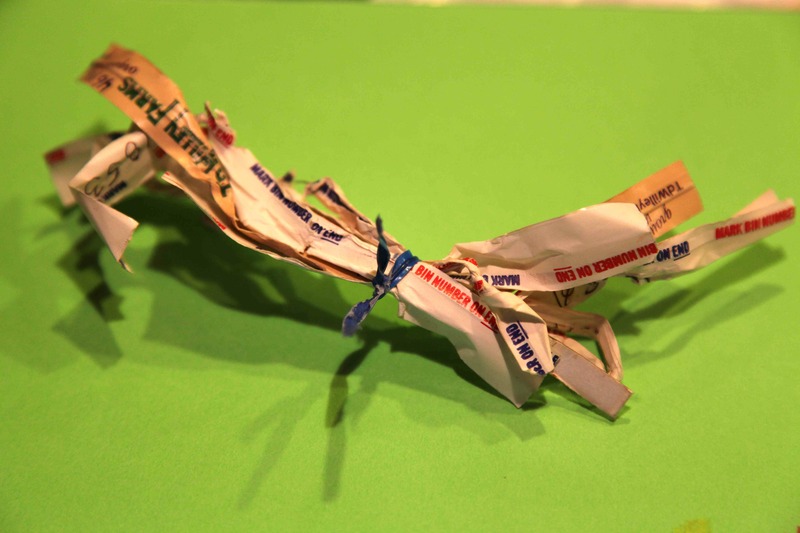 45) Newspaper Garden Uses: There are many reuses for newspaper in the garden. 46) Cassette Tape Bird Deterrent: Pull the tape out of your cassette and string it over your garden. Birds hate the reflective quality of the tape. 47) Feed Bag Tarp: Sew your plastic woven pet food bags together into a tarp for garden needs. 48) TP Tube Seedling Starters: Start your seeds in a tube filled with soil. 49) Sponges in Plant Pots: Cut up your old sponges and place them in the bottom of plant pots. They’ll hold moisture for a long time. 50) Kiddie Pool Raised Bed Garden: Hard plastic kiddie pools make excellent raised bed gardens. 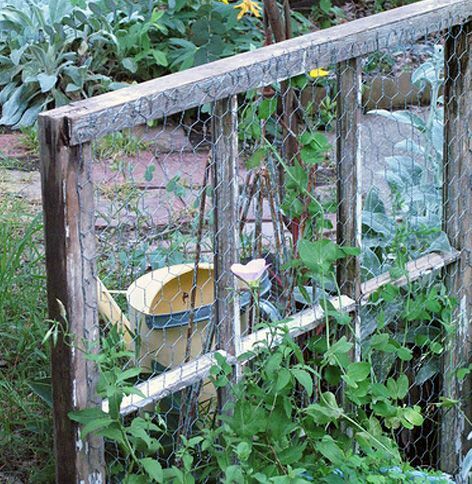 What do you reuse in your garden? Help me add to the list. 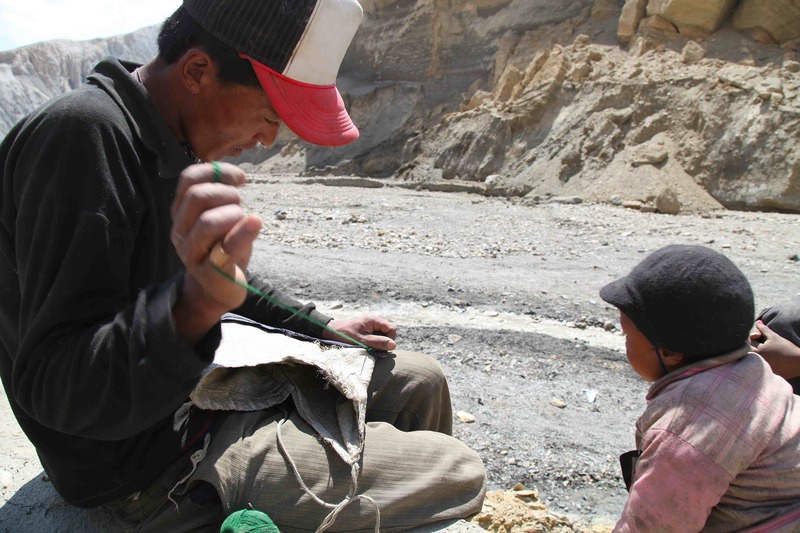 In Upper Mustang, Nepal, there is an ethic of reuse that has changed my ways. Few things are consumed and then simply thrown away, except for candy wrappers, plastic packaging like biscuit wrappers, ramen noodle packets, and plastic bags holding washing powder. These, sadly, are found underfoot in nearly every village. But most plastics in Mustang are put to use in innovative ways. Take the plastic lining for water diversion in irrigation ditches. 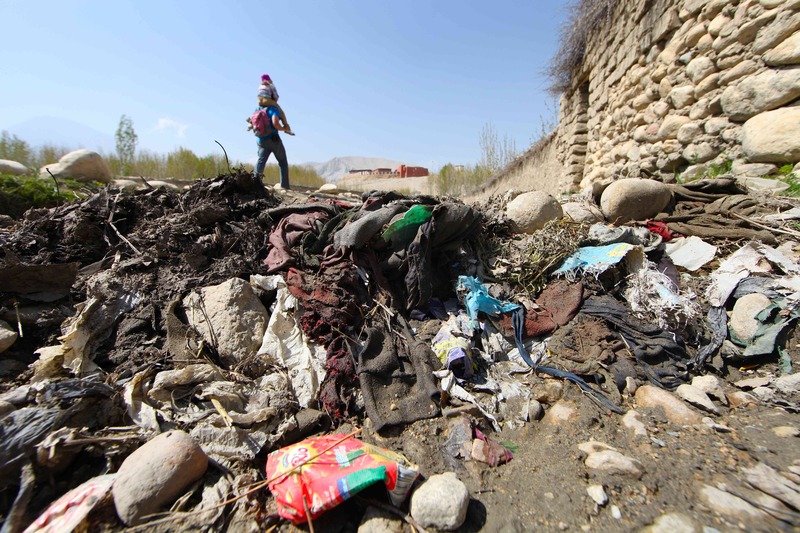 Rather than using jute sacks filled with sand, a readily available material is plastic packaging and bags layered with mud, unwanted clothing and textiles to create an impermeable dam for irrigation ditches. 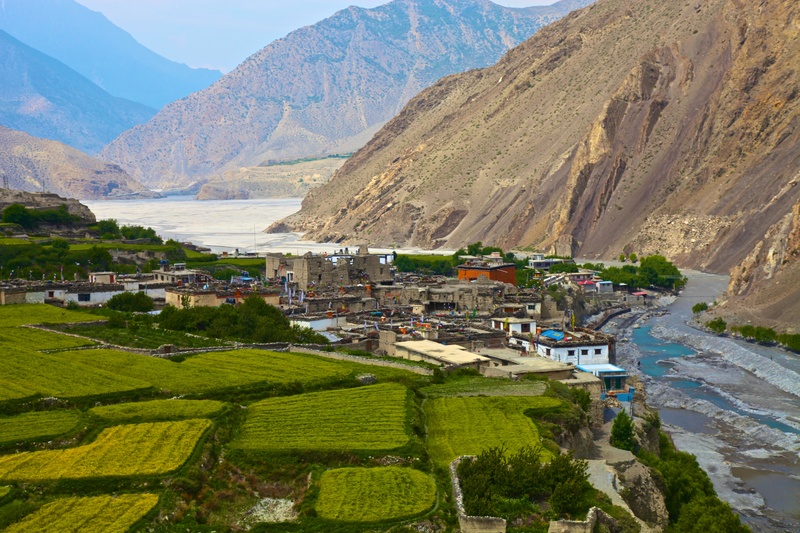 The plastics, unfortunately, often break free and are carried downstream into the Kali Gandaki River where all water flows. One of the most innovative Mustang-style trash hacks is the method by which local horses are fed their grain. 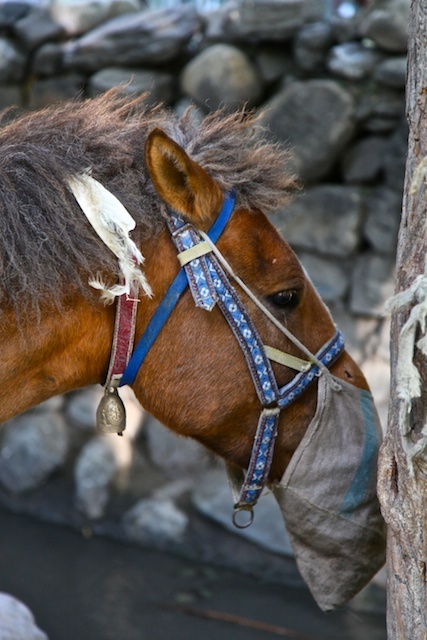 Potato sacks made of woven plastic are sewn into a configuration that fits easily around a horse’s muzzle, with long string handles that hang over the horses’ ears. Corn is measured out and put in the potato-sack-turned-feed-bag, the chaff blown by hand from the corn to prevent the horse from inhaling it in the bag, and the bag is hung from the horse’s ears: a muzzle feeder that’s a brilliant light-weight way to feed one’s horses while traveling. No need for heavy buckets. Whether on-the-go or at home, these muzzle feed bags are the preferred feeding bucket for Mustang equines. 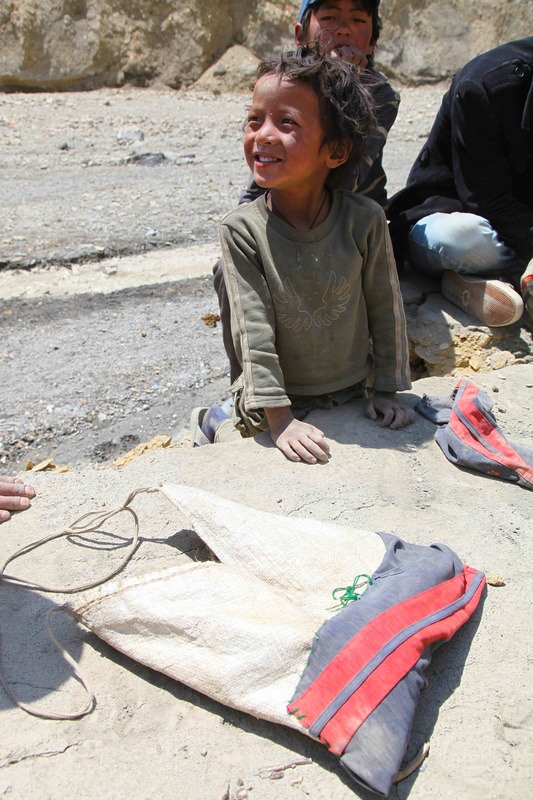 When one becomes worn out and a hole develops, they’re quickly patched up, as this one was mended by a talented tailor friend in the village of Samdzong, utilizing his son’s worn out sweat pants. I grew up with horses and we went through plenty of buckets, some made of PVC and plastic which when broken became yet another hefty item in the landfill. The potato/rice sacks turned into horse feed bags are one of the best reuses I’ve ever seen in a remote part of the world that could easily be adopted world-wide! Anything that is a receptacle is used in Mustang until it can no longer hold anything, disintegrated by sun and wind to the point of uselessness. In the topmost photo of planters, below, you’ll see a plastic bucket that developed a crack and was then sewn back together with plastic twine. 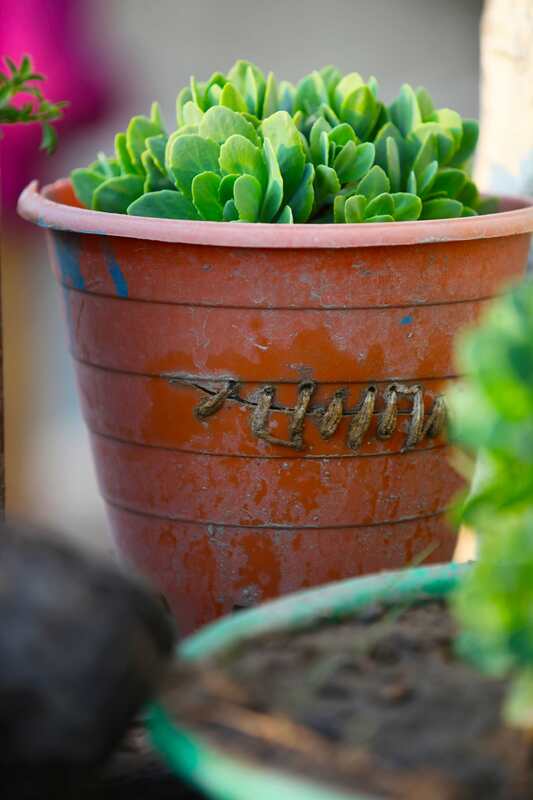 Potted flowering succulents are such a valuable addition of organic color to a household, taking the time to repair that heavy-duty plastic pot is clearly worth the effort. If we treated our own plastic pots and buckets the same way, there’d be a significant reduction in the production of these plastics in the first place, and a renewed ethic which the Lobas, the people of Upper Mustang, haven’t lost, of repairing everything again and again until its useful life is truly over. Now that’s reuse! What are we to do about the plastic berry basket? You know which berry containers I’m talking about: The plastic mesh variety, pint-size and usually green in color that our cherry tomatoes and strawberries come in. They come under the following names: Berry baskets, berry boxes, strawberry baskets, pint berry containers, plastic strawberry baskets, plastic cherry tomato boxes…the list goes on. Why do we need to surround our beautiful fruits and veggies in plastic? It’s not the grocery stores that are packaging your lovely berries. Farmers choose the packaging, but many grocery stores will give feedback to farmers if their customers just don’t want their fresh produce packaged in plastic berry baskets. If you want to avoid accumulating these baskets, simply buy your strawberries and cherry tomatoes only when they’re available in cardboard baskets and if your grocery store only carries plastic ones, give them your instant feedback by not purchasing them and get proactive in letting the store know you’ll start buying berries again when they can provide waste-free packaging. It’s grocery store strawberry season here and I cannot find a single one that’s plastic-free. Ours are packaged in clear clamshell packaging, aka styrofoam, and that stuff is a known carcinogen. No strawberries for us until they ripen in our garden or are offered at the Farmer’s Market or our local garden produce-share group. 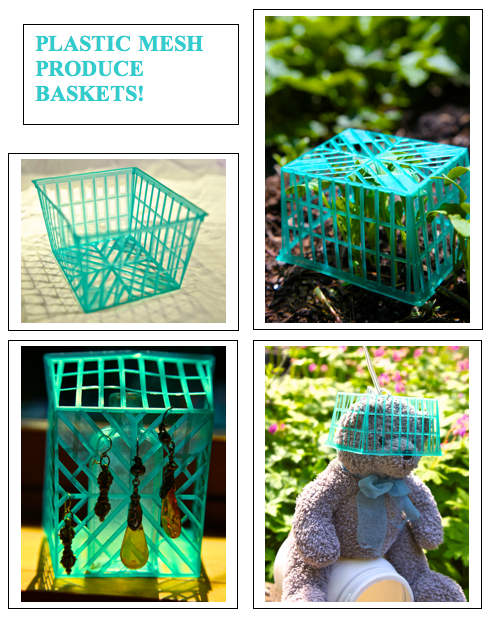 What to do with your plastic berry baskets if you have to buy produce in them? 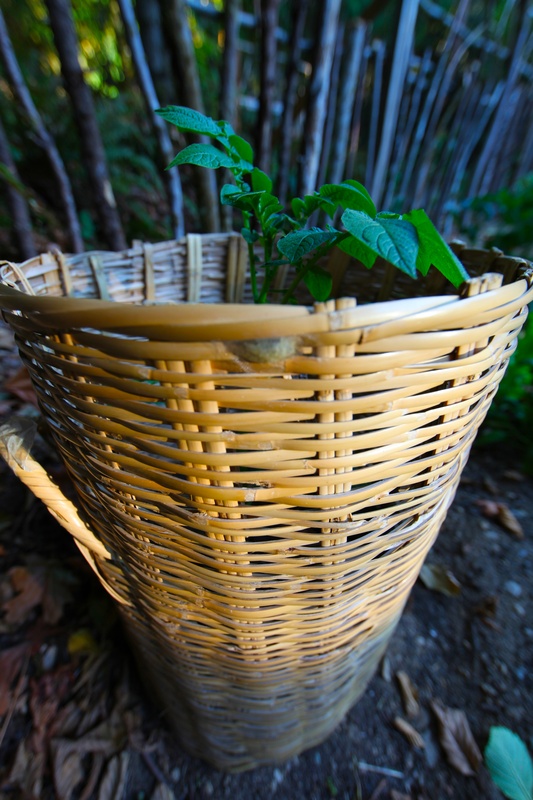 Check to see if your local farmers can reuse berry baskets, if they’re clean. Save them and then pass them along, or collect enough of them to post them on your Buy Nothing group, and you might find a craft group or teacher who could use them. Otherwise, here are 9 ideas to get you reusing the pint berry baskets you might have. 1) Turn them into candy boxes or gift boxes by weaving pretty ribbons through them. 2) Use them as a doll playpen. 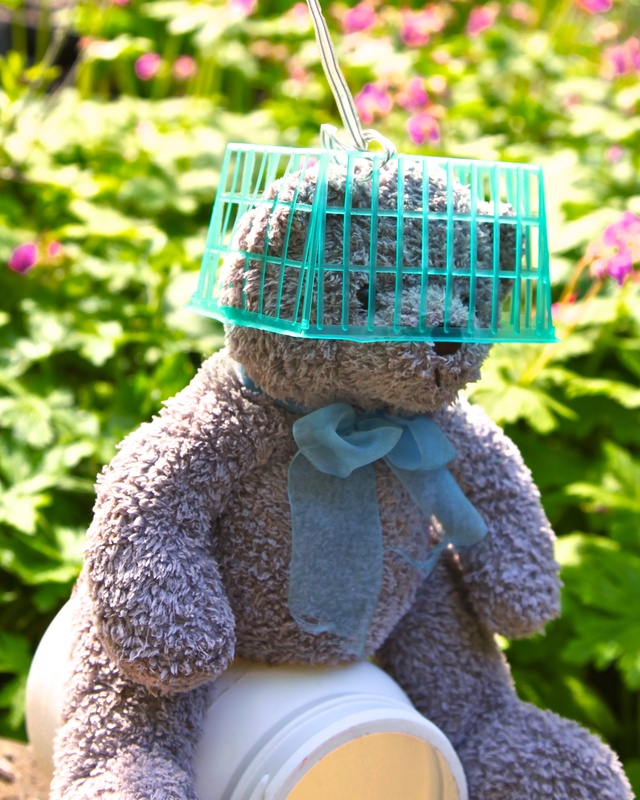 3) Let your child’s teddy bear wear one as a space helmet for galactic journeys. 4) Start your cucumber, melon, and other starts in them by lining them with newspaper, adding potting soil and keeping in a sunny warm space. Then transplant the whole thing, basket and all, into the garden. Roots will grow through the plastic mesh and there will be no transplant shock for your seedlings. 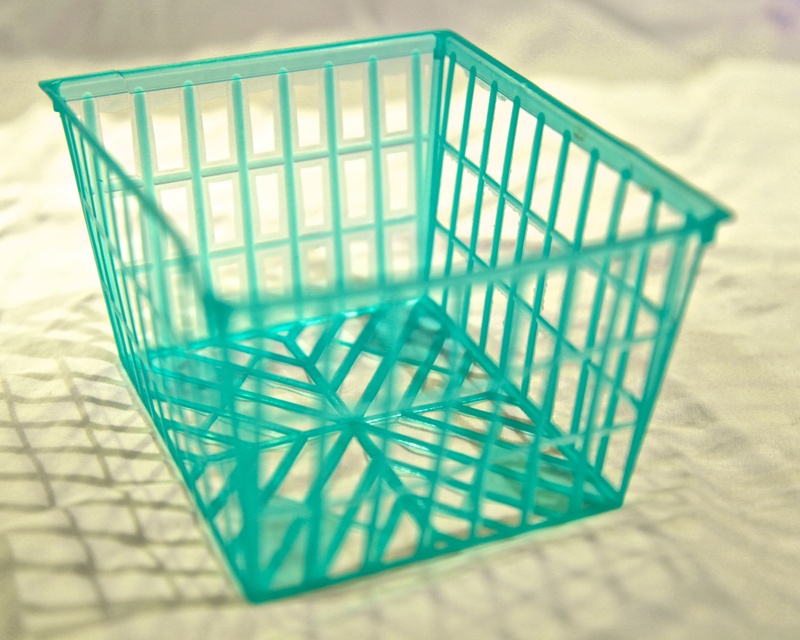 Remember to retrieve the plastic basket from your garden at the end of the season for reuse. 5) Place them upside down over your seedlings in your garden to protect them from birds. 6) Make an Easter Basket. 7) Line them with paper and use as a container for little things in your everything drawer or child’s playroom. 8) Use one as an earring holder/display. 9) Reuse them for your own berry picking. I’m just going to refuse them from now on, and maybe you will, too. If we just stop buying them, maybe the farmers will find better baskets for their berries. 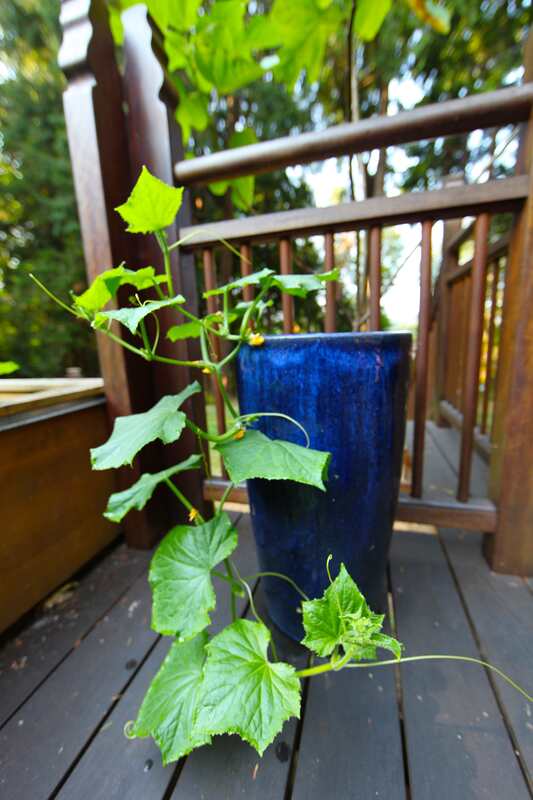 Have a large pot you’d like to plant cucumbers or flowers in? Don’t fill it up with planting soil! Save your soil and fill the base with Styrofoam first. The foam will reduce the overall weight of your planter, enabling you to move it around for best sun exposure. It also acts as good drainage for water. We found some big chunks of styrofoam washed up on our local beach, so I knew that we wouldn’t be able to recycle it. If you don’t have a readily-available source on your beach, save a few styro-blocks to stuff into your large planters. If you’re concerned about the carcinogenic qualities of polystyrene, make sure you place the foam on the very bottom of the planter so the roots don’t touch it. Then, fill with good planting soil, ensuring you’ve filled in all the in-between spaces so your plants’ roots don’t dry out. Studies aren’t conclusive whether there are any known effects of styrofoam or plastics in our soil upon our foods. If so, we’re in trouble. Almost all commercial compost has polystyrene and hard plastics throughout. Most of our styrofoam gets recycled around Earth Day when a local feed store drives our styrofoam to a recycler on the other side of Puget Sound. What do you think? Have you got your own reuse for Styrofoam? We’d love to hear from you. OK, I have thirteen twist tie reuses, but it sounded better with the number twelve. 1) Take them back to the store for your bulk needs and reuse them. I try to remember to bring a stash of twist ties inside my reusable bags for my grocery shopping. If you’re really organized you’ll even have the bulk bin numbers figured out so you can simply reuse the same one over and over again. 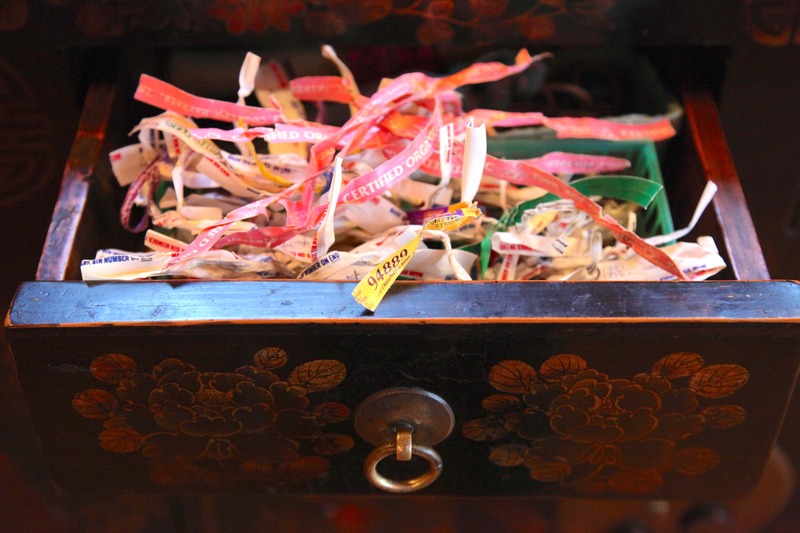 I discovered an ingenious way to decode the bulk bin numbers by….writing the name of the bulk item on the twist ties too! Duh! 2) Tie up plants and vines in the garden with your twist ties. 3) Corral your extra electrical cordage with a twist tie to avoid tripping over them and causing a domestic electronic disaster. 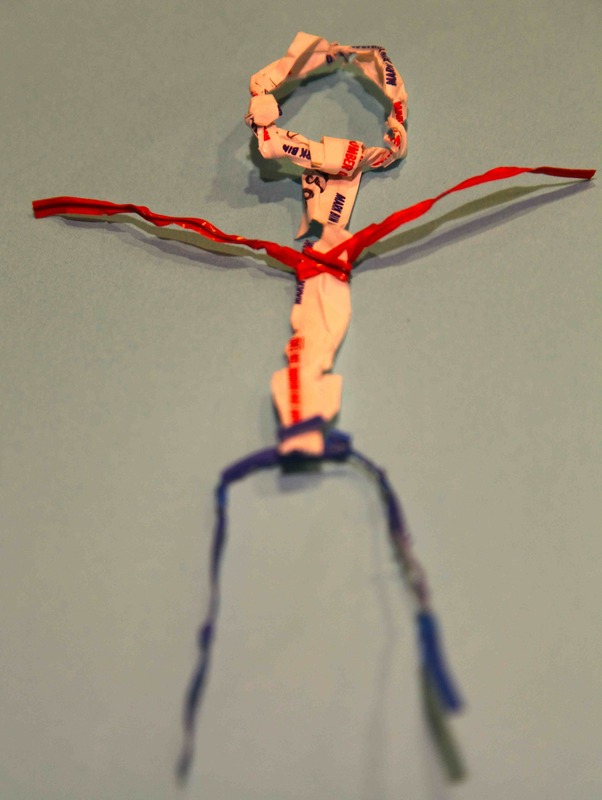 4) Make twist tie stick people. Ok, that was pretty bad. If you want to check out a true master at the craft of twist tying, check out the Twist Tie Guy. 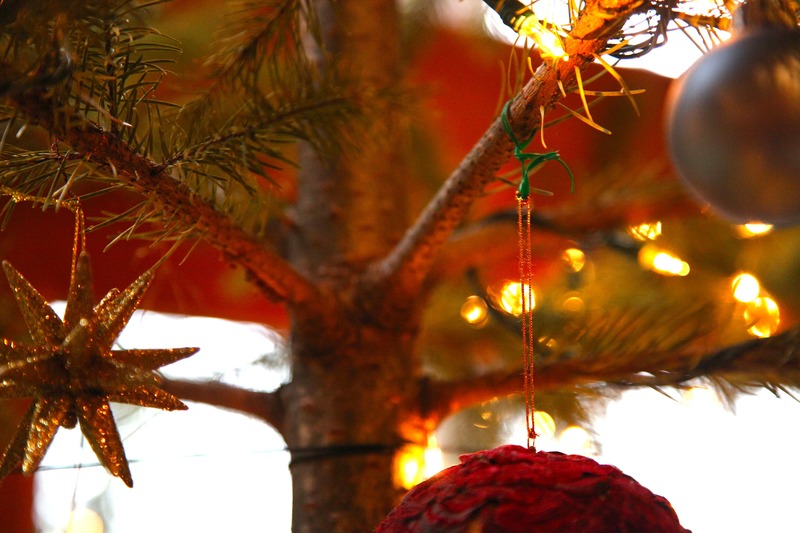 5) Use them to secure ornaments to your Christmas tree. 6) Hold your ear buds together with a twist tie so they don’t get all discombobulated in your backpack or briefcase. 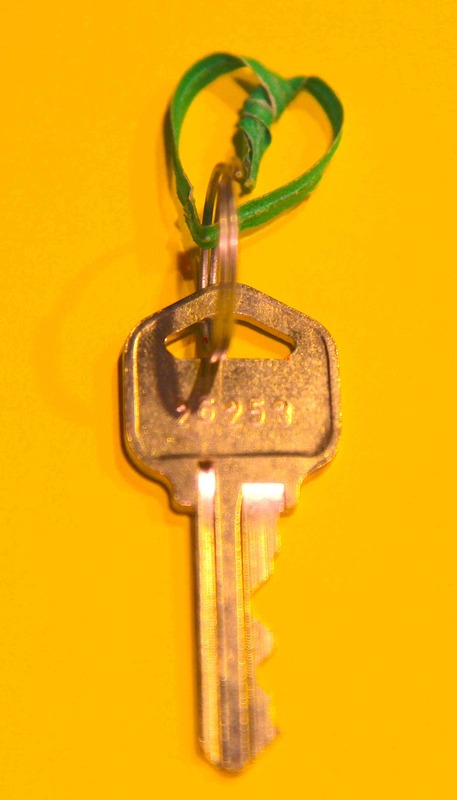 7) Make an obvious key ring heart to identify your favorite house key. 9) Make a 4th of July Centerpiece. 10) Give them away on your Buy Nothing group. I was able to BuyNothing a few of my long pink ones for a local textile recycling project. They’re used to tie up trash bags filled with clothing for Goodwill. Yeehaw! 11) Use one to hold all your, um, twist ties together. 12) Make a set of “Garbage Gods.” They’re more rad than Legos. 13) Recycle them! If you’ve saved up enough of them, I guess you could strip the paper from the paper ones, put the paper in your paper recycling and put the metal in your scrap metal bin. But wait, twist ties may be toxic!? According to some reports the metals used in twist ties are often unknown and could have lead in them. But…many store-bought vegetables like kale and Romaine lettuce are held together by metal and paper twist ties. My local supermarket even uses twist ties to indicate something is organic! What reuses do you practice with your twist ties? We acquired several broken baskets at a town recycling event here on our little island. They were headed to the landfill and I have a thing for almost-perfectly-good large wicker baskets. They can be used for many wonderful things both outside and in. Although most of the baskets were simply missing their handles (and I further dismantled the broken handles so the baskets looked as good as new), I sensed their lives could be extended, or at the very least they could make a final appearance in our fire pit, rather than taking up space in the landfill. Always searching for innovative ways to corral our garden potatoes so they don’t end up growing everywhere in the garden, I decided to try planting a potato basket. If gardeners can plant potatoes in such vertical gardens as trash cans and stacked tires, a wicker basket might prove just as useful, a little more breathable, and a bit kinder on the eye than tires and garbage cans amongst my veggies. Simply add a 4-6 inch layer of compost mixed with soil to the bottom of your basket and then lay your potatoes about 4-5 inches apart atop the soil. 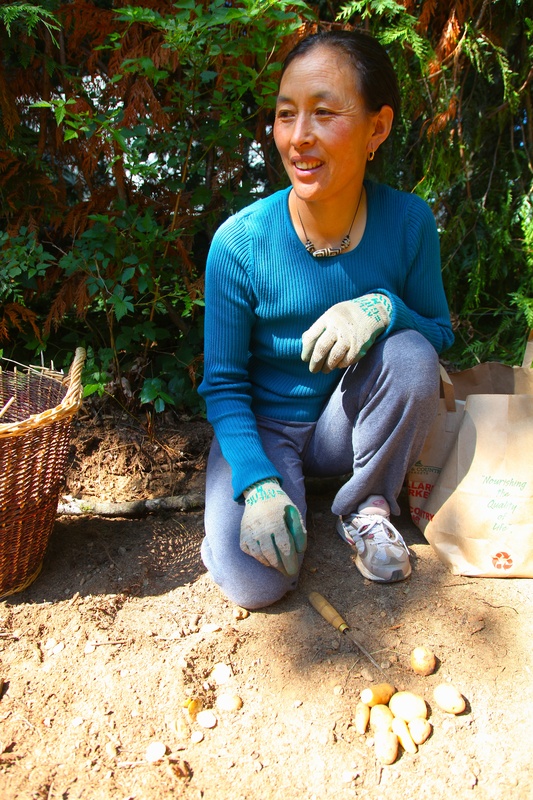 My friend, Yangin Sherpa, who plants acres of potatoes in Nepal (near Mount Everest) claims that she gets the highest yield by slicing inch-long pieces of potato with a single eye on each piece as her “seeds.” We took her advice and planted the little slices in our basket. Then add about a foot of soil on top of your potato slices. We’ve watered the basket periodically, and lo and behold potato tendrils have sprouted a few weeks later! We keep adding more soil, always leaving 6 inches of leaves above the soil level, until the basket is full and we’ll have a basketful of potatoes by the the fall! How do we harvest the potato baskets? 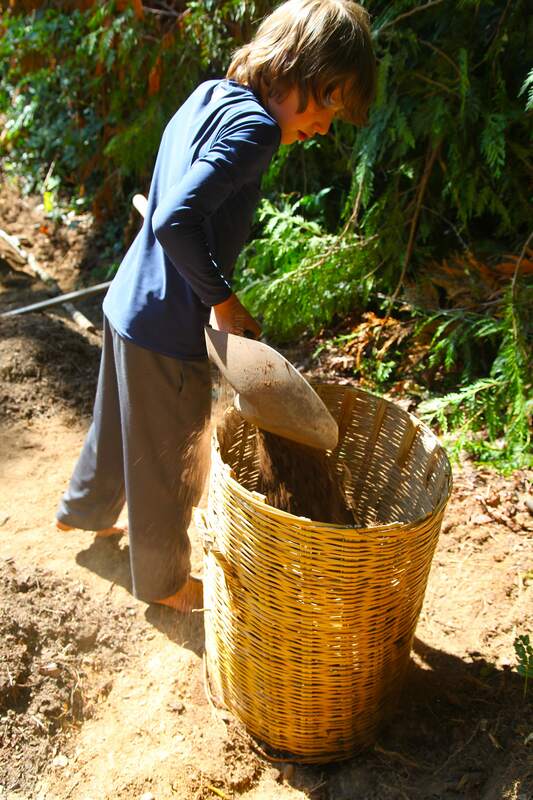 We tip the basket over onto a tarp that we place alongside it, and gently dig out the potatoes in the soil and reuse the baskets until they’ve melted into the Earth. They’ll then be composted back into usable plant food. I don’t have a photo of our potato harvest, but suffice it to say we get a basketful! 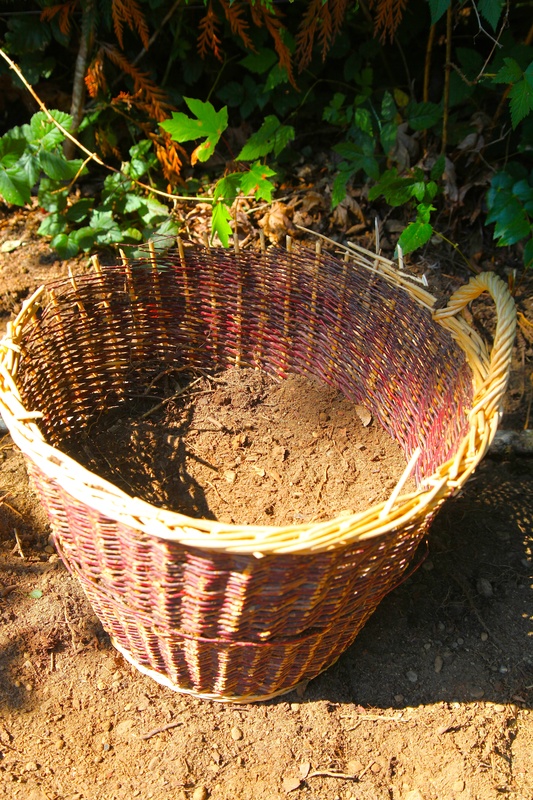 Do you have any broken down basket reuses or innovative ways to plant potatoes? Please share.